Boston Market cornbread is a wonderfully fluffy and sweet cornbread. You will wonder if the Boston Market Cornbread is cake or is it cornbread? Well, I am here to tell you, the Boston Market cornbread is both. 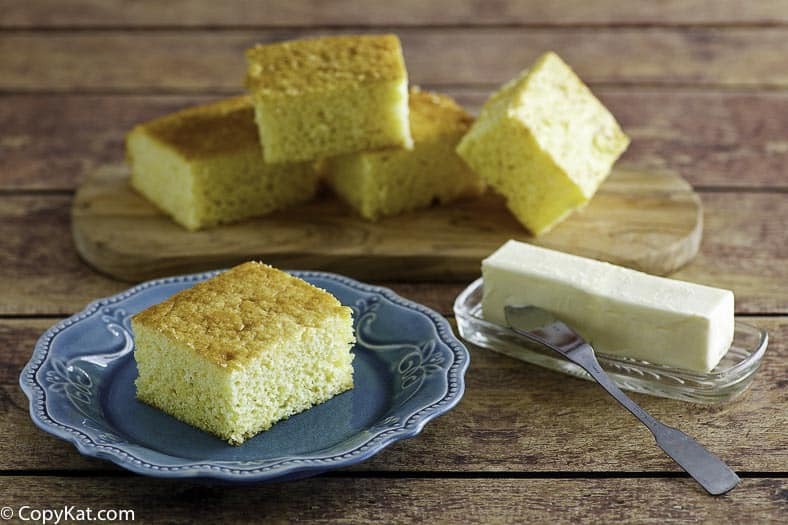 This Boston market cornbread will go very quickly when served. Hands down this is my favorite way to make cornbread. The Boston Market Cornbread is a sweet cornbread that always getts eaten up when it is served. The first time I brought this to a family dinner it was eaten up in a hot minute. This recipe is not from scratch. Over the years I have never been able to recreate this unique flavor from scratch. Boxed mixes provide the base of this recipe. For this recipe, Jiffy cornbread and cake mixes are used. I have found Jiffy mix to be available at most grocery stores. I always pick up a few extra during the holidays, as they are always on sale then. 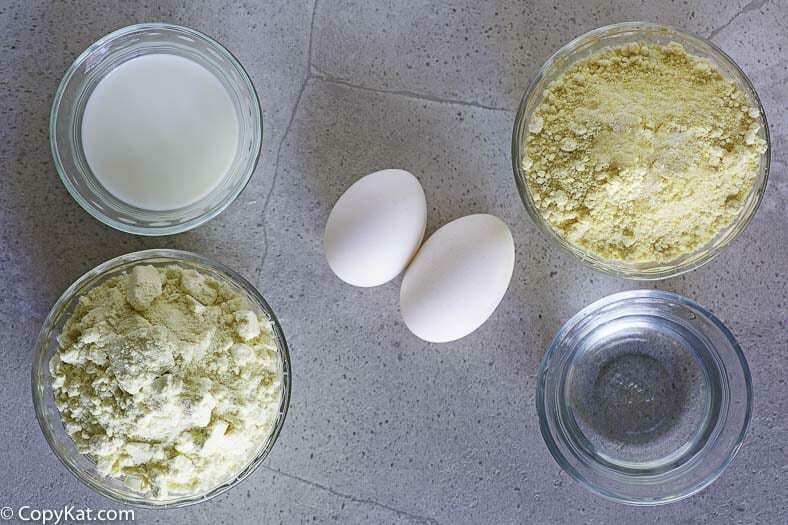 To make this recipe you can simply pour the content of both boxes of the mix into a bowl. Now you will add all of the required ingredients on the directions on the box into the bowl. This recipe makes am 8 x 8-inch pan. 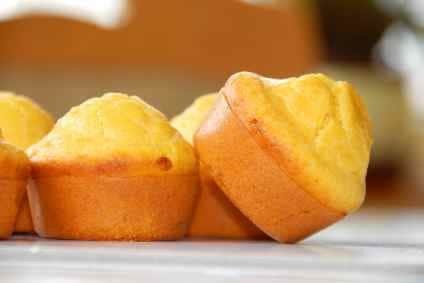 Use 2 boxes of the Jiffy Cornbread mix, and 1 box (15.25 ounces) Yellow cake mix. Note: Use the deepest pan that you have, and fill the pan only 3/4 of the way full. If you do not do this, it may over-fill the pan. This produces a cake-like sweet treat. 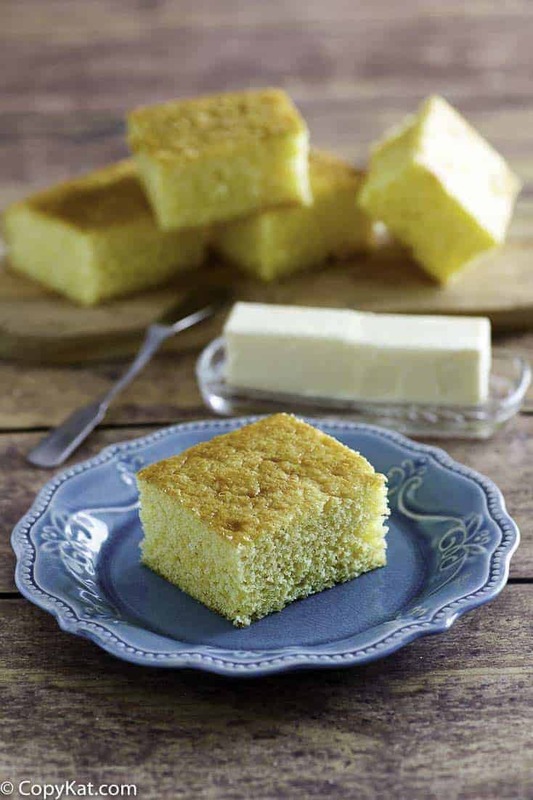 If you have never tried this, you will find this a light, sweet, cake-like cornbread. Make the sweet and savory cornbread just like the Boston Market does. Mix both boxes according to directions, and combine the batter. I generally use a large mixing bowl, and add both boxes together, and add the other ingredients all at once. Fill an 8 x 8-inch pan with the batter. Bake at 350 degrees for approximately 30 minutes. Doesn’t Boston Market’s version have actual corn chunks in it? Just trying to figure out how to get a more accurate version, if possible. Any ideas?? I probably shouldn’t use cupcake liners either right, in order to get the edges crispy? do I need to change the cooking time if I’m doing cupcake size versus baking a whole sheet? I don’t recall the cornbread having any chunks in it. So I don’t know how to make that more accurate. I really felt the recipe was fairly close. The recipe directions have the baking time listed. I hope this is helpful for you. It was Kenny Rogers restaurants that had corn in it. So make the corn bread per box and the cake mix per box and then combine the two mixtures? If you are using Jiffy mix (cake and cornbread) 1 box of each. IF you are using regular boxed cake mix it’s 1 box of cake mix, and 2 boxes of jiffy corn bread mix. This is much go to cornbread. Totally awesome. I’ve never had anything Boston Market. I’m just looking for a good corn bread recipe after eating at a small diner in South Carolina. Thanks Stephanie for all the great recipes. Going to use 3 boxes of corn muffin mix with one cake mix for a less cakelike texture. The box mix has the ingredients on it, I think it will take no more than 4 eggs. I do not think there is any butter used in the recipe. will faint when I serve it. The cornbread is 8.5 ounces, their cake mix is 9 ounces. I would try whatever you like best. For me BBQ ribs mean summer so that I would do a homemade ice cream. This was a disaster. Cornbread stuck to the pan. Ended up scraping it up out of the pan in little pcs. I’ve been making cornbread for years. Nothing like this ever happened. The Jiffy cake mix box said to line the pan with wax paper. I’ll have to try that next time. Well they should have some corn muffin taste. How did it go with the fudge marble? You used a marble fudge cake mix with a corn muffin mix? Really…….. I used to make the cornbread for Boston Market. This is good but doesn’t taste anything like the real thing; it is much too cake-like. I will try making it with half a box of cake mix and 2 boxes of Jiffy next time. Interesting, well I appreciate your suggesiton. Funny then why try this one if you know the real one?? So how do you make BOSTON MARKETS cornbread? Maureen, did your company actually make the cornbread mix for Boston Market? May I ask who it was? Oh yeah, I love the butter yellow cake mix.